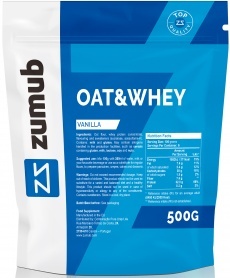 Zumub Oat & Whey… when oat and whey come together to enrich your day! Zumub Oat & Whey is a premium versatile product that makes it easier and more convenient to consume proper amounts of essential macro and micro nutrients to support your physical active lifestyle. Oats - this cereal is universally known to be a powerhouse of vitamins and minerals such as manganese, phosphorus, calcium, iron, selenium, magnesium, zinc and vitamins from complex B. It also provides considerable amounts of proteins and gives a feeling of fullness due to an impressive concentration of dietary fiber. Whey protein concentrate is probably one of the best protein sources on the market as it has everything to ensure proteins associated benefits - it is highly bioavailable, easy on the stomach and features the whole range of amino acids being a complete protein. Top nutrition and energy - a combination of oats and whey protein concentrate is just right to support you throughout the day. Quick and convenient - just mix with water or your favourite beverage to enjoy as meal replacement. A variety of ways to use - have it as a filling shake, bake pancakes or make it an alternative to conventional flour. Buy Zumub Oat & Whey to experience that healthy living can be delicious and easy. ALLERGEN INFORMATION: Contains Milk ingredients.,Contains Gluten,May contain allergens handled in the production facility: cereals containing gluten, soybeans, milk, lactose and nuts. WARNINGS Oat & Whey : Do not exceed recommended dosage. Keep out of reach of children. This product should not be used as a substitute for a varied and balanced diet & healthy lifestyle. This product should not be used in case of hypersensitivity or allergy to any of its constituents. Contains sweeteners. Store in a cool, dry place. Please Recycle. BEST BEFORE: Please see lot number and expiration date stamped on the packaging.